The 2015 holiday season is upon us and one of the toughest gifts I have to shop for, are the gifts for my crafty friends and family. I always like to take it up a notch and give them something to make their crafting unique, and often, that turns to tech. 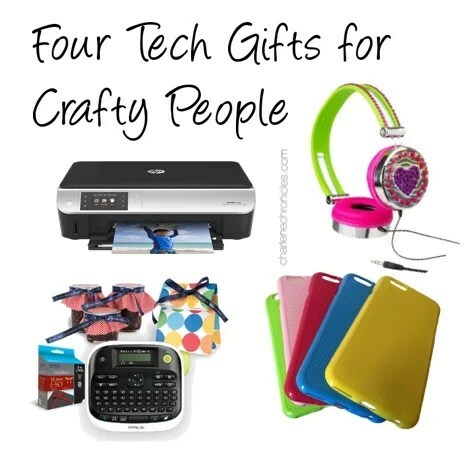 Here are my top four picks for great tech gifts for crafty people. 3. Alex Brands Bling DIY Headphones: If you are going to rock out while making crafts, shouldn’t the headphones reflect your craftiness? These headphones may not be as good quality as Bose but are a fun, inexpensive gift. It may also provide inspiration (and practice) to bling out those Beats headphones. Do you have a favorite tech gift to give to a crafter? Let everyone know in the comment section below! Charlene Chronicles may have received some of the items mentioned in this post, but the content, idea and details in the post are not influenced or contributed to this blog by any brand.